Innovative Competition Traction Bar - Pann Auto Performance - San Diego largest aftermarket automotive performance parts - What do you drive? he INNOVATIVE MOUNTS Competition/Traction Bar Kit is designed to increase the rigidity and stability of the vehicle’s front suspension. By tying-in the front lower control arms to the frame, the front suspension becomes more solid, thus increasing traction and eliminating wheel-hop. For front wheel drive drag racers and road racers, this directly results in reduced 60-ft times and cornering speeds. The design of the bar not only reduces unwanted lateral lower arm movement, but also ties the lower chassis legs together providing a much more rigid and stronger setup. 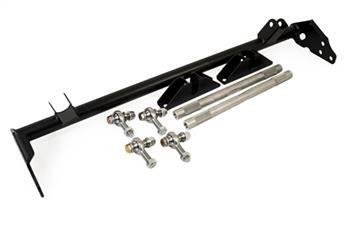 This Comp/Traction bar kit is powder-coated for durability and corrosion resistance, as are the steel radius arms. Each radius arm is equipped with a race grade heim/spherical joint allowing for an OEM fitment that is adjustable to suit all vehicle setups, whether a pro-load is needed or just to stop unwanted movement that can cause changes in suspension geometry during high speed cornering or launching. The Comp/Traction bar will work with engine swaps and can be used with full or half sized radiators. Due to its slim design it will also accept the use of larger down pipes and manifolds.